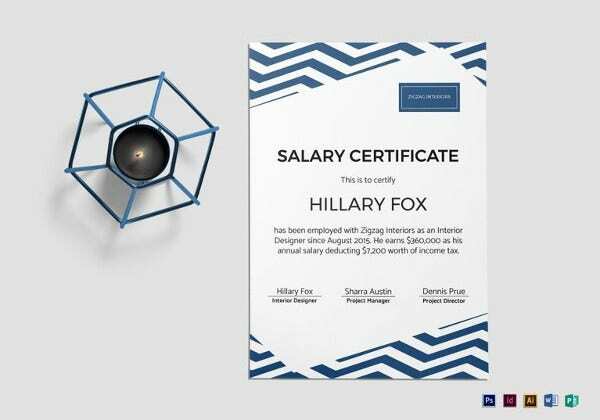 The template system is quite an amazing option for people who have little or no time to create salary certificate for their business. It is obvious that creating the certificate from scratch is going to take quite some time, which is the reason why the blank certificate template has become an alternative option for many people. You may also see Certificate Samples. 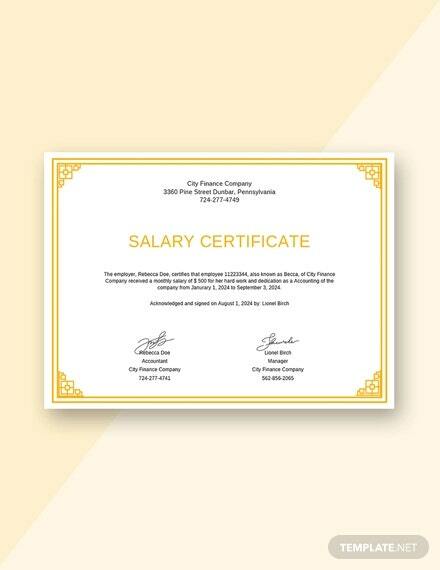 The salary certificate, just as the name suggests, refers to the salary documentation of an employee. It’s the legal proof that you have a dependable, regular and verifiable income. The employers are bound to issue salary certificate if an employee asks for it at the end of the financial year. 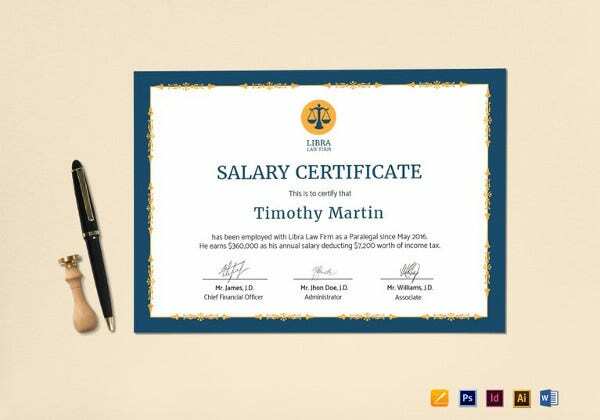 What Constitutes a Salary Certificate? A salary or pay certificate is needed for various purposes and in places where the employee is needed to produce his employment & income proof. Banks usually ask for salary certificates when an employed person is about to open an account with the bank, say savings account. The smart landlords today run a background check on the financial credibility of prospective tenants before handing on their property to the latter. Thus, if you are planning a lease application, you must ask your employer beforehand to support you with a salary certificate- so that you can establish yourself as a reliable tenant. The certificate of employment with compensation that is issued to the employee by the employer also establishes that the business duly acknowledges the contribution of the employee- and that he/she is compensated fairly for his efforts towards the company. 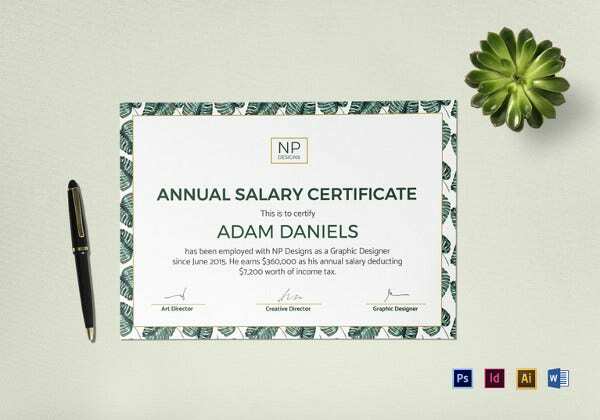 The salary certificate must state the entire salary structure of the employee and not just the net amount that he gets end of the month or annually. Thus, it would include the details on basic salary, house rent, convenience allowance & gross salary. 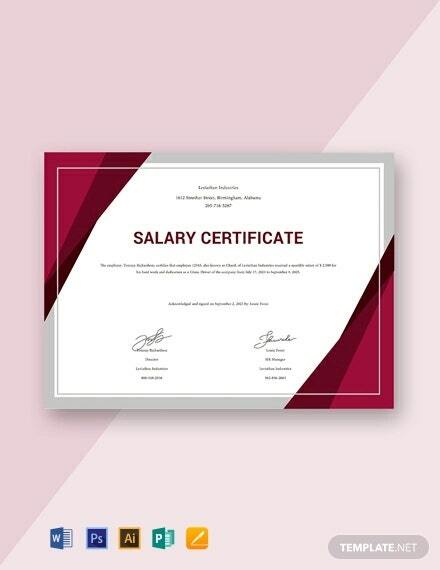 At times, the salary certificate must also mention the period of payment of the employee, such as monthly, biweekly, per project etc. Under the deduction section, the certificate should provide a complete break-up of the deductions from the salary, including figures on –Income tax, E.O.I.B., total & net payable salary. 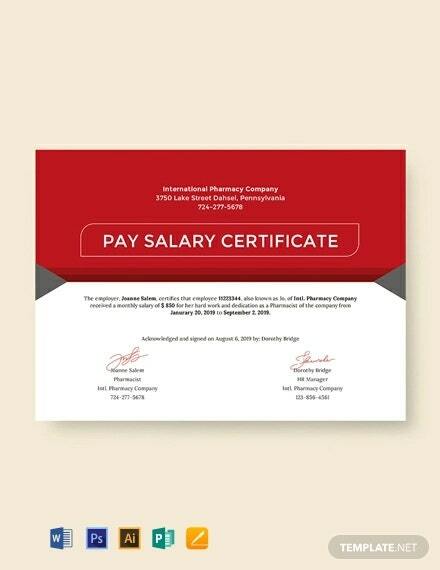 The salary certificate letter will begin with a letter or declaration from the HR department of the company, acknowledging that the concerned employee is employed with the specific company and draws a salary. The certification would also mention the date of joining of the employee and his position. If the employee is leaving the job and need the certificate for his new job application, the certificate must also mention the employee’s last date with the company.After the salary & deduction details are discussed, the certificate will say that the salary certificate has been issued to the employee on his specific request. Think the times you wished you would do less and gain more. 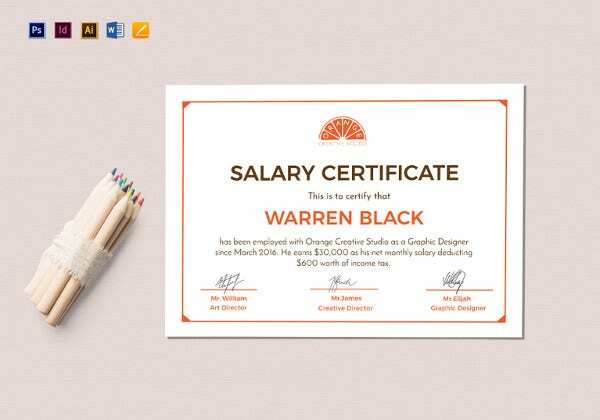 The Employee Certificate Template helps you do write less, and still end up with the best output at the end of the day. There is no longer a need to spend money unnecessarily on a task you can now do on your own. 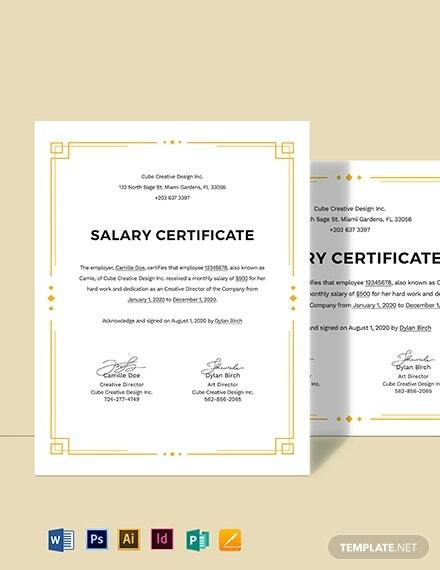 instead of hiring someone to do to the certificates for you, simply download the remuneration certificate templates, edit them to make them more personalized, print them and then use them. You see! You got this working for you without paying even a single buck. The employee’s name, position in the company and date of joining should be clearly mentioned. All the figures related to salary details must be correct. All the figures related to deduction details must be correct. 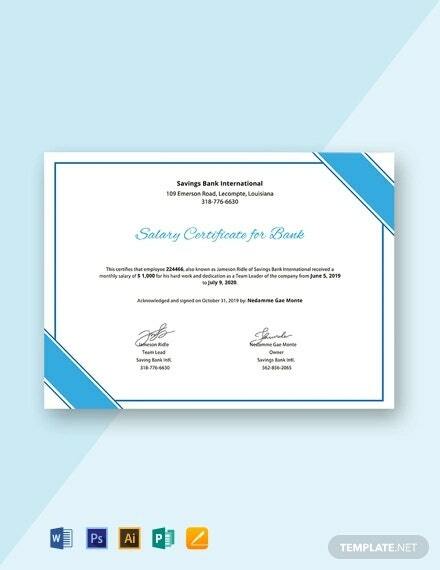 The certificate must be signed by HR department of your company and the CEO. Use separate tables to discuss salary structure & deduction details. 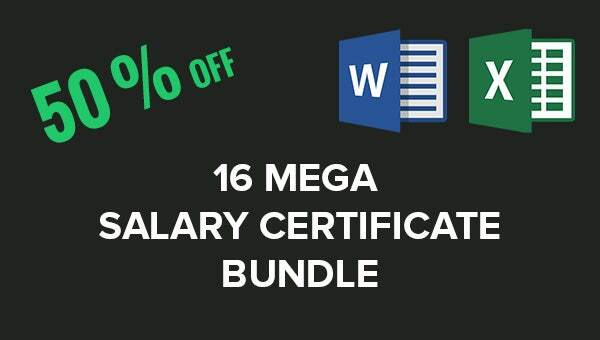 Give your HR department at least a week to construct the salary certificate. 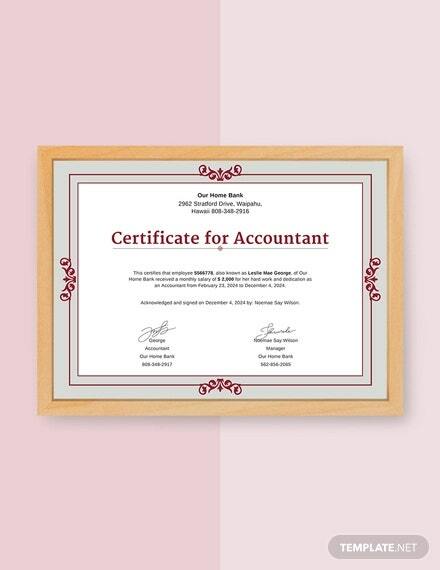 No spelling mistake or typo issue is allowed with your name, the salary or deduction figures on the certificate.